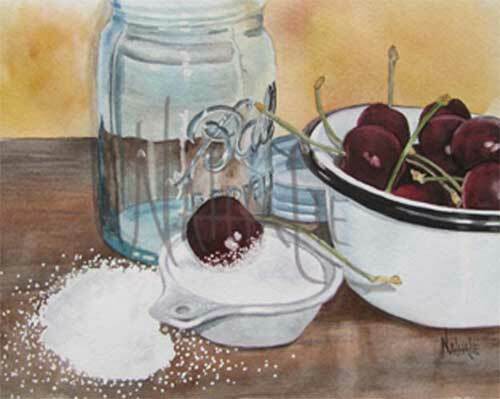 I was setting up the all the elements in this painting and one of the cherries jumped out of the white enamel bowl and landed in the cup of sugar. Actually, I tipped the bowl and knocked the cherry out. I was going to clean up the mess then decided that I really liked the way it looked. It was fun painting the sugar on the cherry. Isn't it wonderful when something good comes out of a situation that, at first, looks like a real mess?